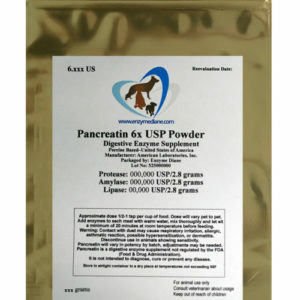 Each batch of Pancreatin will vary due to the organic nature of the porcine glands. Each package will be labeled with the potency from the Certificate of Analysis for that batch. If you have a sensitive dog this information will be very helpful. Material has a Reevaluation date of at least 15 months and often closer to 2 years. Pancreatin is negative for Salmonella sp. as well as E. coli. Manufactured and packaged in the USA from porcine glands from the USA. Approximate dose 1/2-1 tsp per cup of food. Dose will vary pet to pet. Add enzymes to each meal with warm water, mix thoroughly and let sit a minimum of 20 minutes at room temperature before feeding. Pancreatin will vary in potency by batch, adjustments may be needed. Warning: Contact with dust may cause respiratory irritation, allergic, asthmatic reaction, possible hypersensitization, or dermatitis. IF ON SKIN: In case of contact with skin wash skin with soap and water. Remove contaminated clothing and wash. IF IN EYES: In case of contact with eyes, flush eyes with low pressure water for at least 15 minutes. If irritation develops, seek medical attention. IF INHALED: Avoid breathing dust. In case of inadequate ventilation wear respiratory protection. If breathing is difficult, remove victim to fresh air and keep at rest in a position comfortable for breathing. May cause sensitization by inhalation in hypersensitive individuals. Avoid dust generation. If experiencing respiratory symptoms: Call a POISON CENTER or doctor/physician. Discontinue use in animals showing sensitivity. Pancreatin is a digestive enzyme supplement not regulated by the FDA (Food & Drug Administration). It is not intended to diagnose, cure or prevent any disease. Consult Veterinarian about usage. 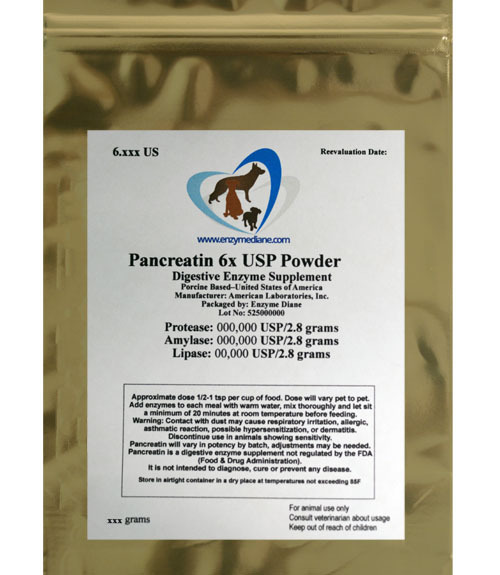 Pancreatin is a digestive enzyme supplement not regulated by the FDA (Food & Drug Administration). It is not intended to diagnose, cure or prevent any disease. For pet use only.